WELCOME to Lyons’ Den, the first dedicated gourmet burger restaurant in Shrewsbury. We are a family business with a strong belief in using local produce to make the best burgers in town. Super tasty, super fresh and with a super low carbon footprint. Shropshire boasts so many fantastic food producers, why would we go further afield?! Our butcher is Corbett’s Jon Sykes, based in Shrewsbury Market Hall. The Lyons’ Den is located in the heart of Shrewsbury, in Traitors Gate. Formerly occupied by Traitors Gate Brasserie, we have totally refurbished the interior to reflect our gourmet burger experience. A rustic style with an unpretentious menu, a fully licensed bar, made-to-order milkshakes… a fun, family-friendly meal out! Click here to take a virtual tour of The Den! Everything is homemade at The Lyons’ Den. 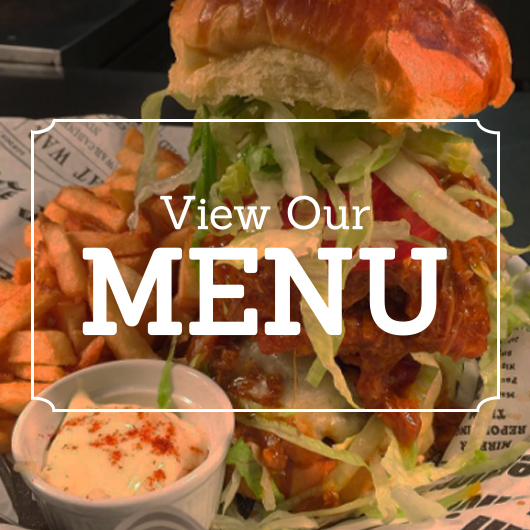 From the coleslaw through to the chocolate brownies and the burgers themselves of course, Adam, Kelly and the team will ensure that you have the tastiest of dining experiences. Our prices are competitive too for the quality you receive. To book a table for lunch or dinner, please call 01743 233225 or click here to contact us online.